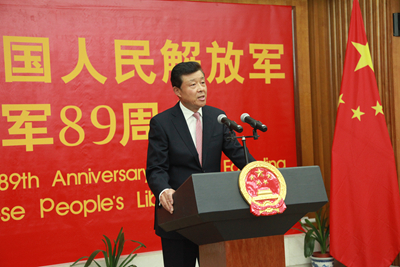 On the evening of 1 August 2016, Chinese Ambassador Liu Xiaoming and Madame Hu Pinghua held a reception at the Chinese Embassy to celebrate the 89th anniversary of the People's Liberation Army. The reception was attended by over 230 people, including Deputy Chief of Defence Staff Lt Gen Gordon Messenger, Assistant Chief of the Air Staff AVM Richard Knighton, Major-General Benjamin Bathurst, officials from the Foreign and Commonwealth Office and Ministry of Defence, people from all walks of life in the UK, military attachés of foreign embassies in the UK, representatives of Chinese-funded institutions, Chinese students and overseas Chinese. 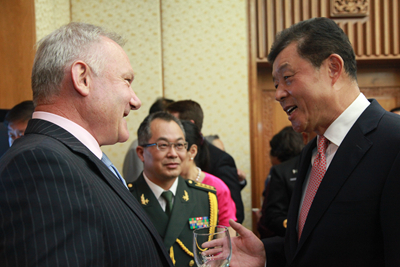 Ambassador Liu Xiaoming delivered a speech at the reception. He reviewed the PLA's achievements and its contribution to world peace and stability. He said that China was committed to the path of peaceful development, to a defense strategy that was defensive in nature. The development of China's defense and military capability would not target at any country. China would not pose any threat to other countries. Nor would China exceed the need of ensuring China's own national security. At present, China is deepening reforms of its national defence and military system. The goal is to build a modern military force with Chinese features. Such a military force will need to better fulfill the responsibilities of safeguarding China's sovereignty, territorial integrity, development interests and maritime interests. And it will need to maintain regional stability and global peace. Ambassador Liu highlighted the current important historical juncture in China-UK relations: Next year will mark the 45th anniversary of the establishment of ambassadorial diplomatic relations between China and the UK. The journey over the past four decades and more highlights the importance of shared commitments to mutual respect, equality and taking into account each other's core interests and major concerns. 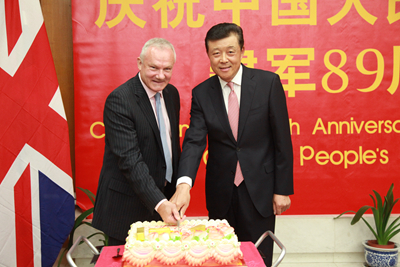 These commitments have served as the cornerstone of China-UK bilateral relations. They are the basis for sustained growth and improvement of our relationship. What China and the UK have achieved in recent years are proof enough that these commitments are crucial as both sides carry on to further advance the relations. Both countries should bear in mind the historical experience and lessons, and value the current hard-won momentum of China-UK relations. Both countries should bear in mind the responsibilities and the fundamental interests of the two peoples. Both countries should work together to achieve win-win results not only for China and Britain but countries and regions beyond. This should be the way to ensure that the growth of bilateral relations will always benefit the two peoples and contribute to world peace and prosperity. Ambassador Liu pointed out that military-to-military ties were an important part of China-UK bilateral relations. Recent years have witnessed stronger cooperation and deeper mutual trust between the two militaries. Since early this year, there have been frequent reciprocal visits by high ranking military officers. There have also been a number of exchanges that were carried out across services, at various levels and in multiple fields. These achievements give every reason to believe in a brighter future for China-UK military-to-military ties. The Ambassador looked forward to greater concerted efforts from both sides to enhance high-level contacts, to deepen communications between the troops, and to make new breakthroughs in bilateral military cooperation. The reception was in a warm and friendly atmosphere. Guests congratulated on the 89th anniversary of the People's Liberation Army, commended on the great achievements in defence and military modernisation, and fully recognised the active contribution of PLA to maintaining world peace, stability and prosperity. During the reception, a documentary PLA Today was shown together with a photo exhibition on PLA's achievements and active participation in international peacekeeping and rescue in recent years.